Ugandan English is a variety that has scarcely been noticed in past research. This timely volume brings together African and European scholars in a first-ever collection of articles that offer comprehensive discussions of the historical and present-day sociolinguistics of English in Uganda and fine-grained analyses of the structural characteristics of and attitudes to this hitherto largely unknown… variety. 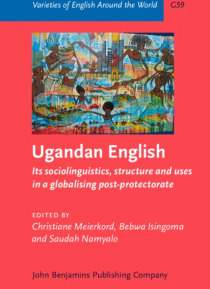 Using rich archive, corpus, and interview data as well as ethnographic and observational methods, the various contributions paint a comprehensive picture of Ugandan English as distinct from other East African Englishes and as characterized by nativisation despite a still strong exonormative orientation, reflecting the modern nation's status as a post-protectorate under the influence of globalisation. Apart from advancing our understanding of Ugandan English itself, the individual chapters contribute to theoretical debates on language contact and variation as regards the influence of substrate languages, founder populations, language ideologies and socio-economic factors.